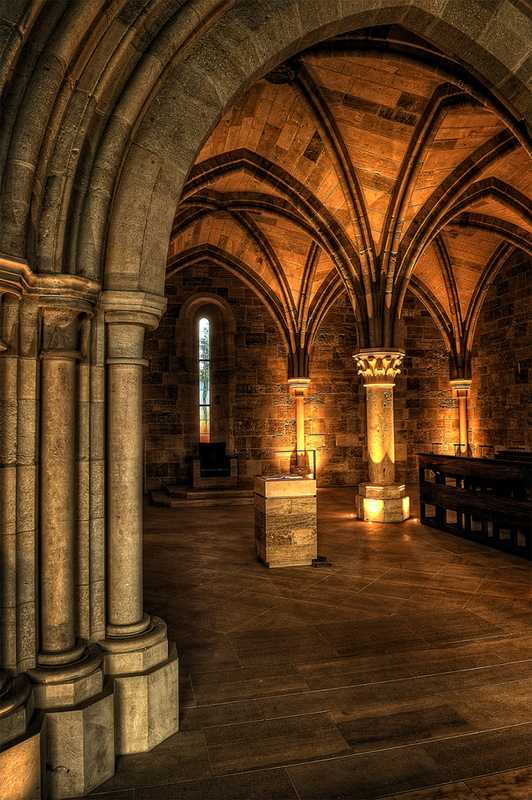 The new monastery at New Clairvaux was originally a 12th C. monastery in Northern Spain. In the early 1930's William Randolph Hearst bought the monastery and imported it to California. Shortly afterwards, the Great Depression and World War II made it impossible for Hearst to build it, and he deeded it to the City of San Francisco. There it languished for 40 years behind the De Young Museum. Fr. 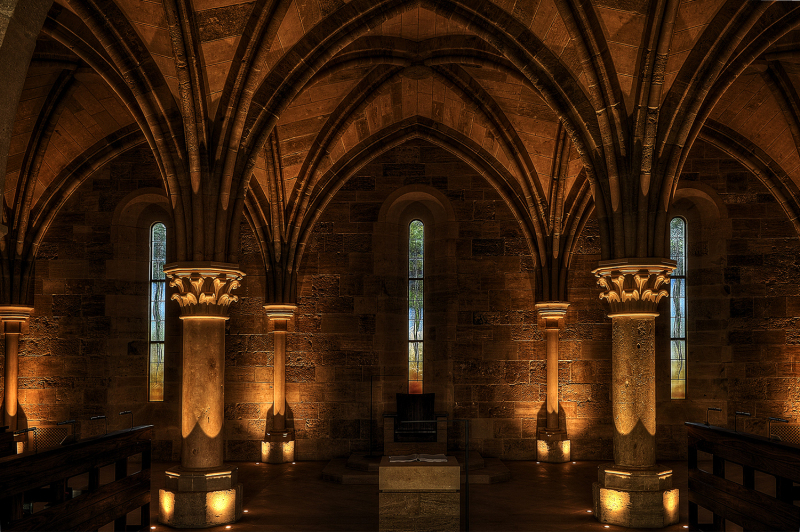 Thomas Davis, a young monk newly arrived to the New Clairvaux Monastery, heard the story, saw the stones ,and had a vision of acquiring the stones for the new Abbey in Vina. With persistance and time, the Monastery acquired the stones, though half had disappeared by then. The Abbey consulted with British and Spanish historians, and hired German stonecarvers to re-form and recut the missing stones. The Cistercian charism of simplicity is expressed here in a contemporary style with a reference to its ancient history. 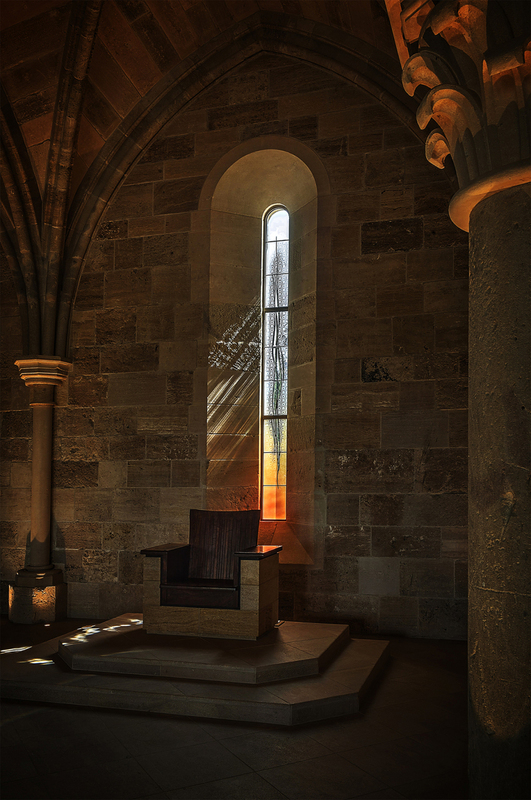 The art glass in the European 12th c. Cistercian monasteries is abstract, simple, and often soft amber and white in color. The windows appear simple at first glance, but in fact, are complex in their fabrication. Since the monks worship during the day and night, materials are used which are active both day and night: thus, the use of reflective 24 karat gold luster. 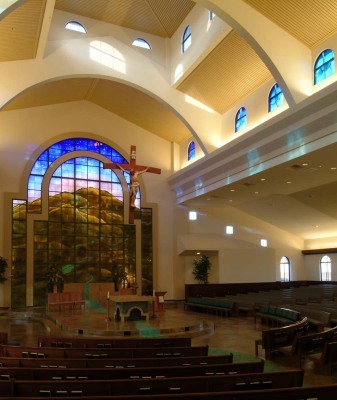 This new church was formed from six parishes. 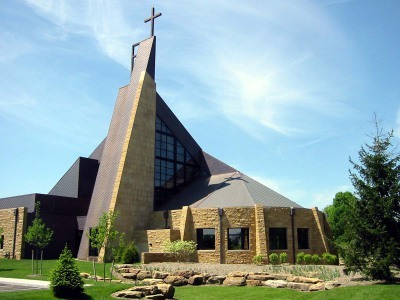 Unity was this parish's desired theme. The design reflects this rising intertwining movement towards unity. The central area is painted and kiln-fired with 24 karat gold luster in the form of a cross. The gold luster is bright and reflective at night. The vibrant colors of rose, purple and lavendar bring warmth to the cold, gray Wisconsin winters, and are also symbolic of the heavens. Facing east, the first morning light was casting a glare. 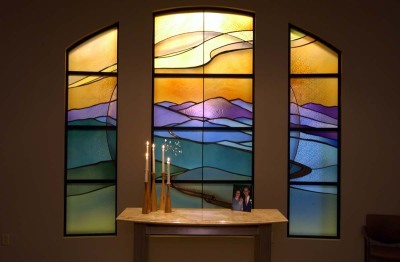 Lamberts Antique glass in Germany custom-made mouthblown glass with a thin layer of opal to diffuse the glare. Following my watercolor design, micro-layers of gold-pink and cobalt change with the shifting sunlight and gray skies. 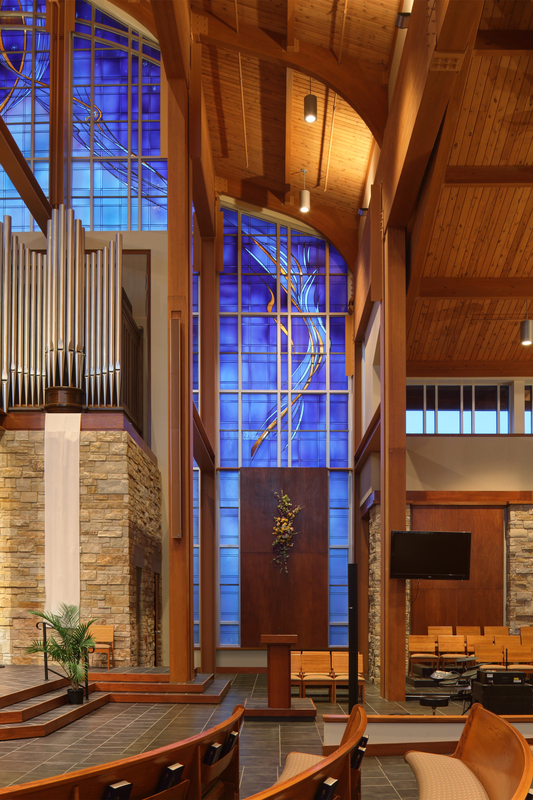 Handmade bevels are interspersed throughout the "veil" to intensify it, and with direct sunlight the bevels cast prisms into the Sanctuary. East facing, the windows of shaded olive and white translucent hand-blown glass diffuse the uneven view of the surrounding building and glare as the colors reinforce the architect’s established palette. 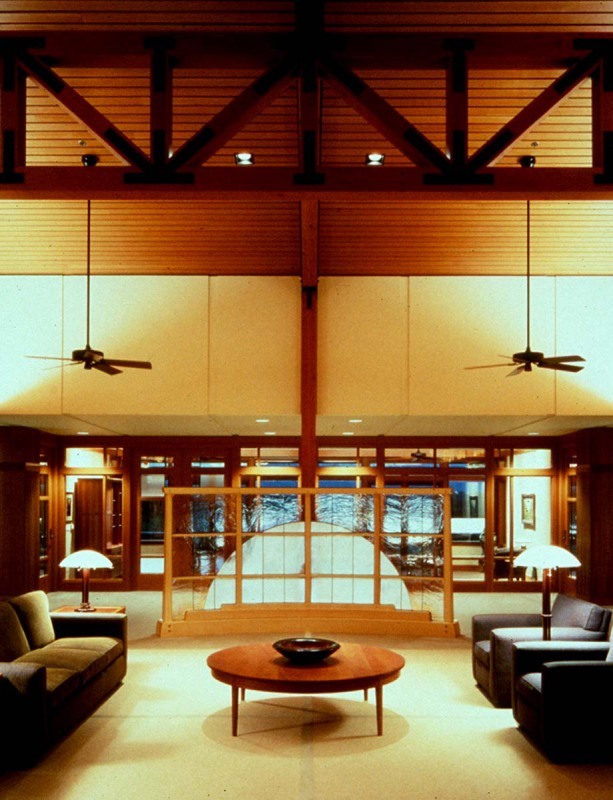 Likewise, “chevron” mullions mimic the architecture’s geometric pattern. Handmade bevels capture the prismatic light and project it into the a interior space. The selection of mouthblown shaded red to clear glass was key to creating the airy soft transition from the "Spirit" form to the background. The detail pattern (below left) was an "icon" of nearby sacred landmark, Mt. Tamalpais, tying it into its "Sense of Place". Painted and kiln-fired with 24 karat gold luster, the pattern is reflective at night. Architect, Renzo Zecchetto, says, "the main actor here is light." 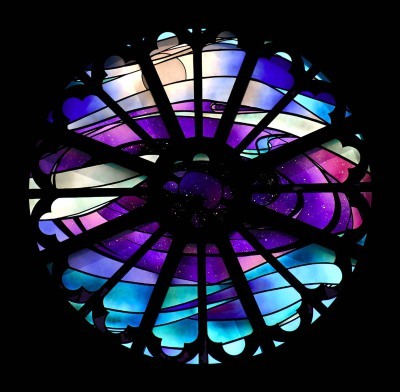 As the light shifts, the eye sees first hints of the olive grove outside the glass, then the lavendars and purples (symbols of penance) become bright and opaque, dramatically projecting color and prismatic light into the space. Mouthblown Fremont antique glass of Seattle, and “flashed” with micro layers of shaded color and opacity, the glass is carefully cut and edge-polished, then laminated onto a piece of tempered glass with a special optical silicone. 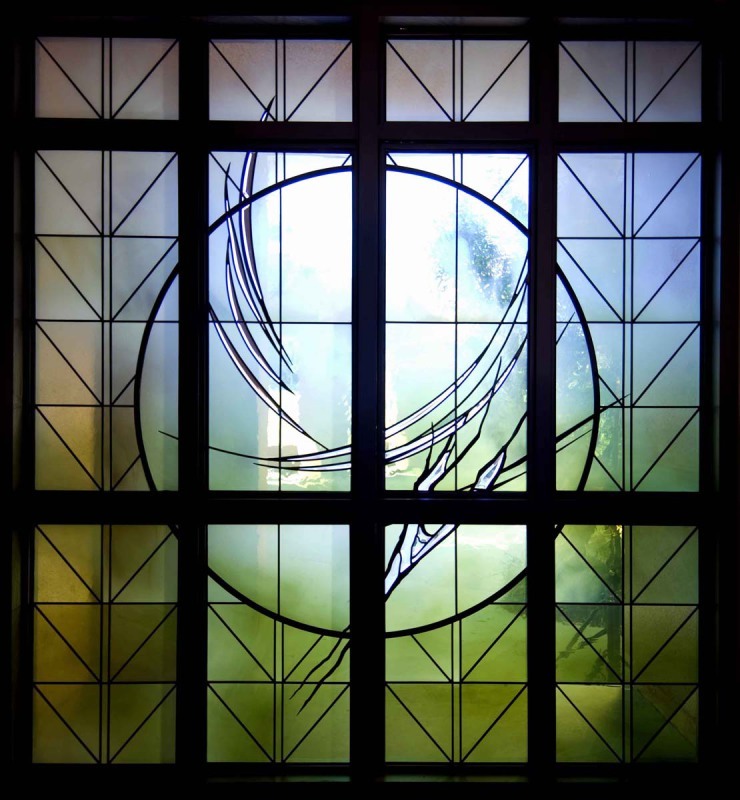 Thus, it has a much lighter effect than leaded glass. 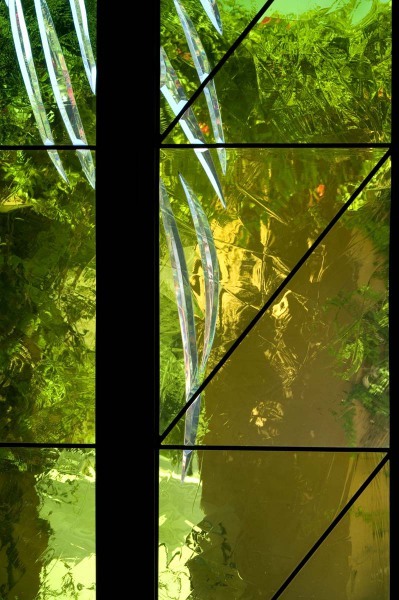 Handmade laminated prisms “float” diagonally to direct the eye around the corner from left to right panel, while the dividing lines gradually "compress" from top to bottom, giving the design a refined geometry. "NM Native flora / fauna"
The client wanted designs that speak to "wellness"
inspiraton, and calm". Knowing nature has a calming effect on people, my proposal answered their need with the focus on Northern New Mexico native plants . This was also a continuation of the facility's theme of native plants and trees. They also wanted a site-specific design approach. 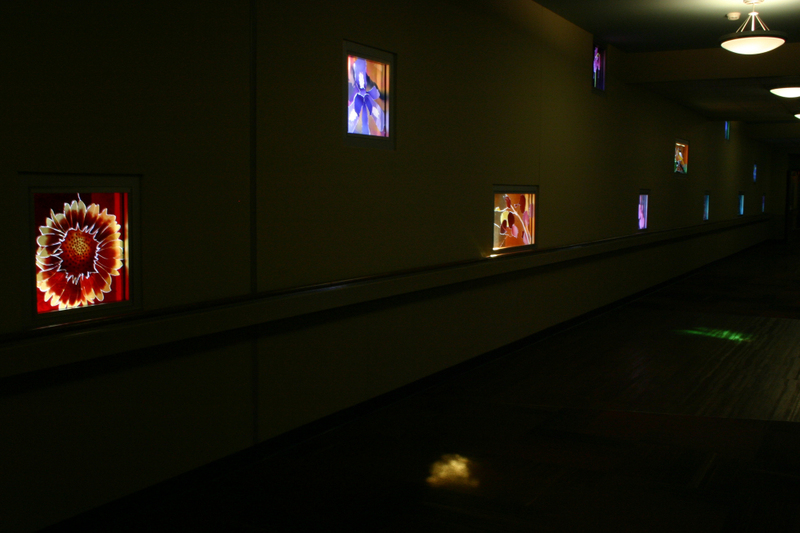 The hallways leading to the lobby faced east and west, capturing and projecting the morning and evening sun. 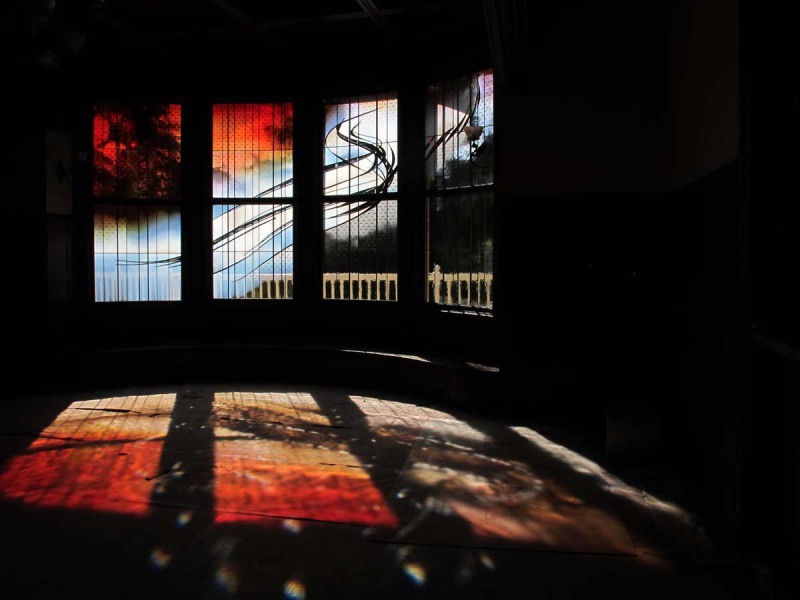 With direct sunlight each of the 22 windows splayed projections of color across the floor and walls. The artwork also had to be "durable, and low maintenance." 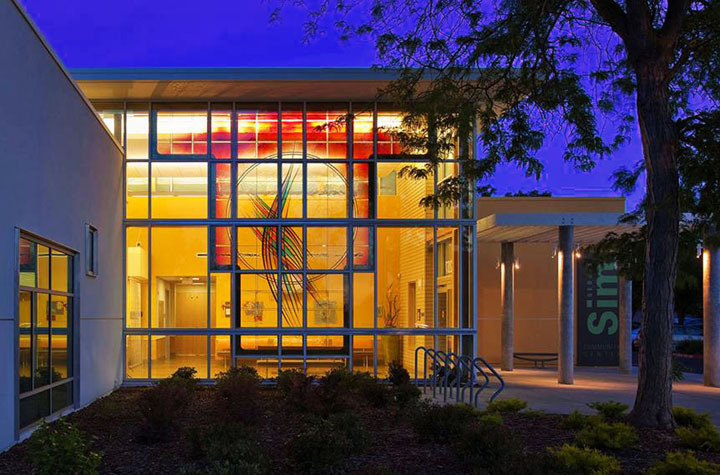 Each panel is double-glazed, with a clear tempered piece of glass facing the hallway, then a layer of mouthblown colored glass laminated to the tempered glass with optical silicone. It was gratifying, seeing how the residents chose particular favorites and made them their own. Triple- flashed (three layers) rose shaded to purple hand-blown glass was etched to the clear layer to portray the constellations. 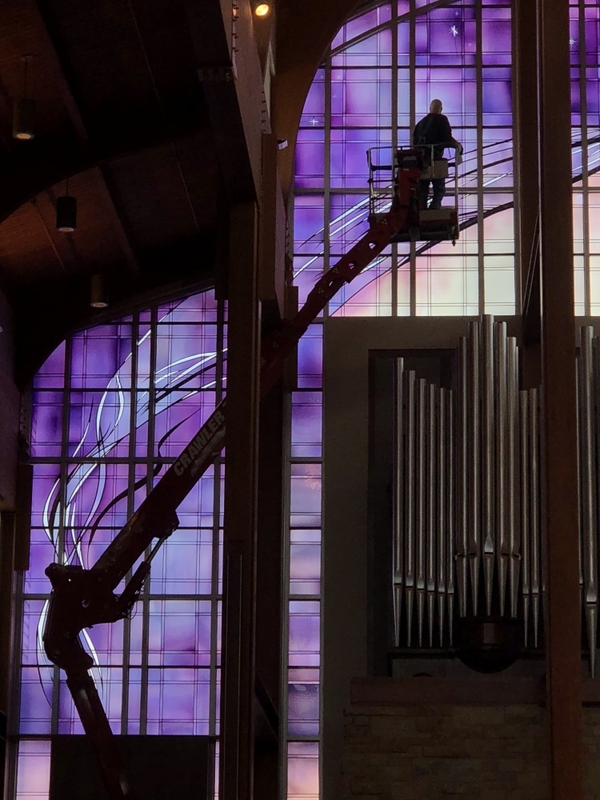 The transition from "sky" to "center" was accomplished by selecting custom blown rose to clear and purple to aqua glass. This allowed the glass to be sparyed and fired with orange luster, creating the subtle transition from lavender to amber. 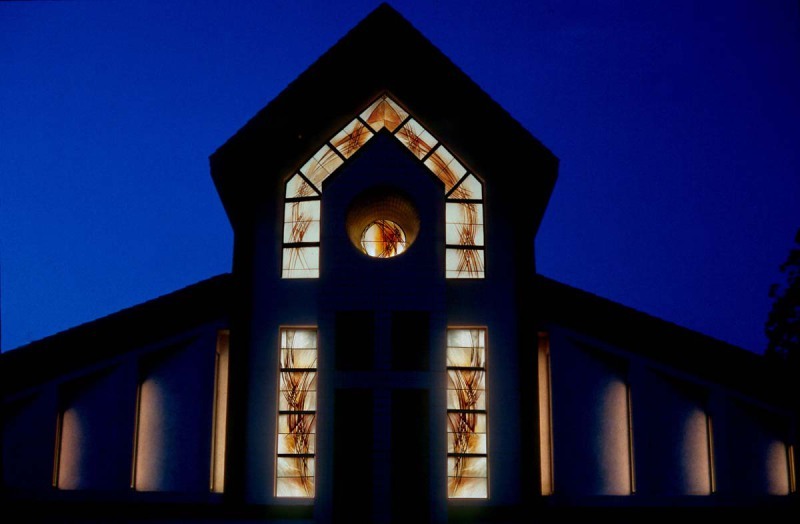 The amber "Center" was leaded and laminated front and back with lead "overlay" "branches" to refer to beloved artist Ruth Azawa's twig-like cross in the sanctuary. The Center was a spiral, linking it to the Labyrinth in the space. Throughout a large field of hand blown glass is a geometry composed of clear bevels. In the center an organic and abstract form suggesting a tapestry of many colors intersects a circle also framed by clear bevels. 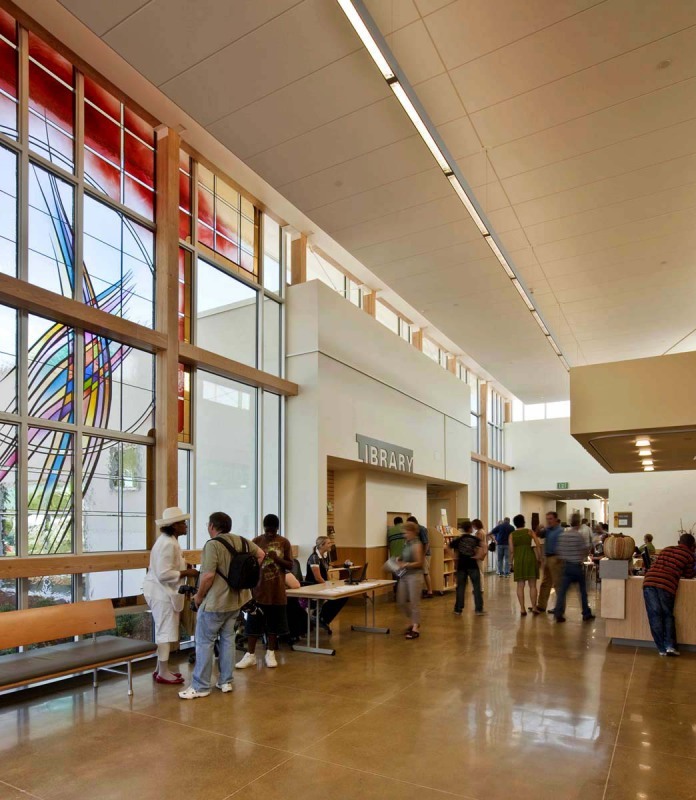 The tapestry is symbolic of the many different ethnic groups that are members of this Sacramento Community Center. 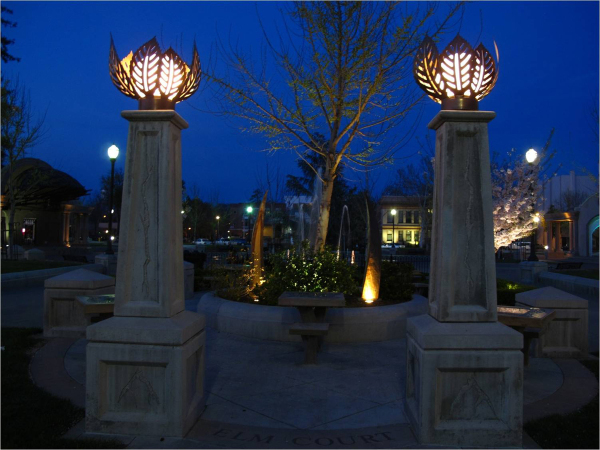 Kiln-fired gold luster delineates the design’s stepped down borders and offers warm reflections of the community at night. 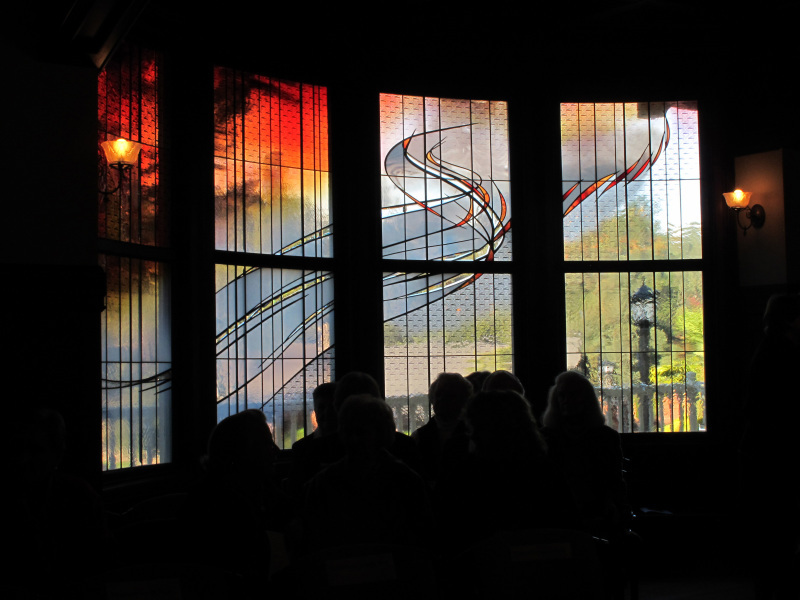 The art glass for the sanctuary needed to mitigate the glare and allow select exterior views. 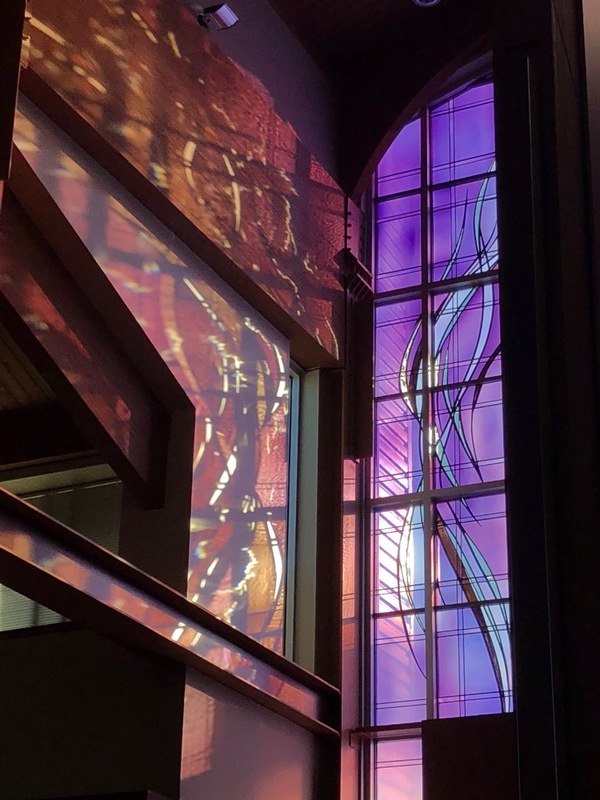 The designs focal imagery of “flames” of transparent red and amber glass used the glare to project their dramatic color within the church. 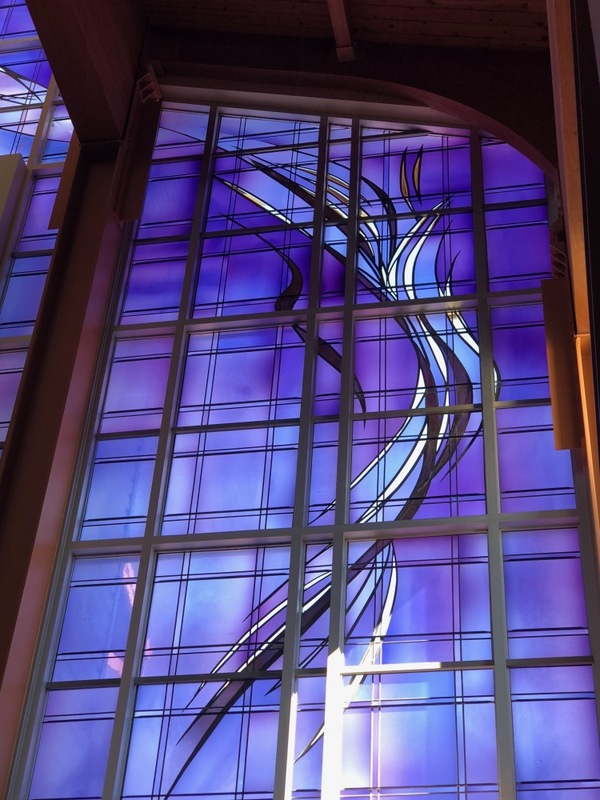 The shaded purple glass was translucent to diffuse the glare. 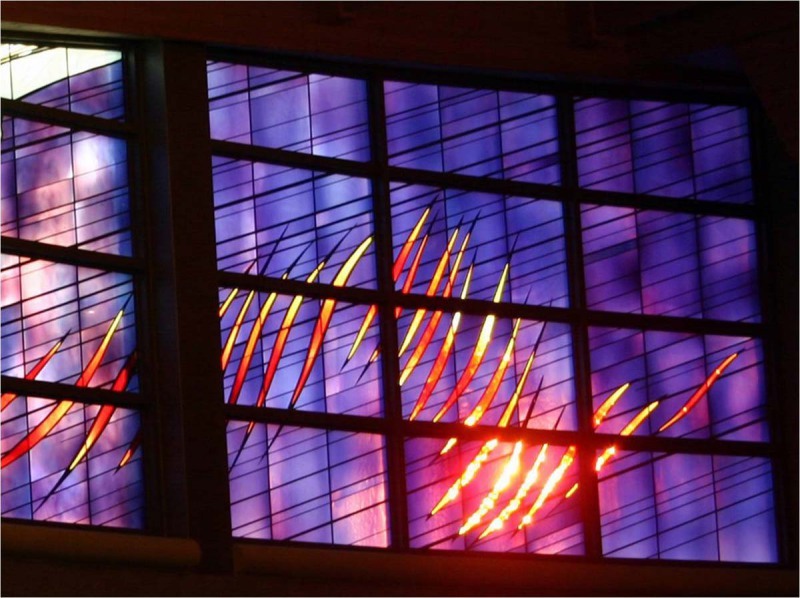 The design is symbolic of the scriptural text: when the Spirit appeared in the Upper Room after Jesus' death, and a "gust of wind" fillled the room, and "tongues of fire" appeared over the diciple's heads. The patron saint of this parish suggested the theme "The Beat of Wings" . The problem of glaring light was mitigated by using a translucent light glass. 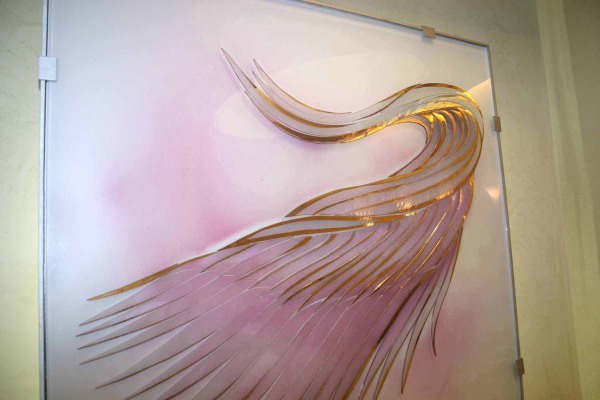 The suggestion of feathers and wings was achieved by using white on clear streaky handblown glass with its unique patterns. The design was painted and kiln-fired with gold luster, silver stain, and colored enamels to create the free form watercolor effect. The top layer of 24 karat gold luster is reflective at night. Columbus, Indiana, is an architect's pilgrimage place, and Ratio Architects of Indianapolis saw this as a wonderful opportunity to add to the town's rich architectural treasure. Inspired by the chambered nautulis, the Sanctuary faces both east and north. 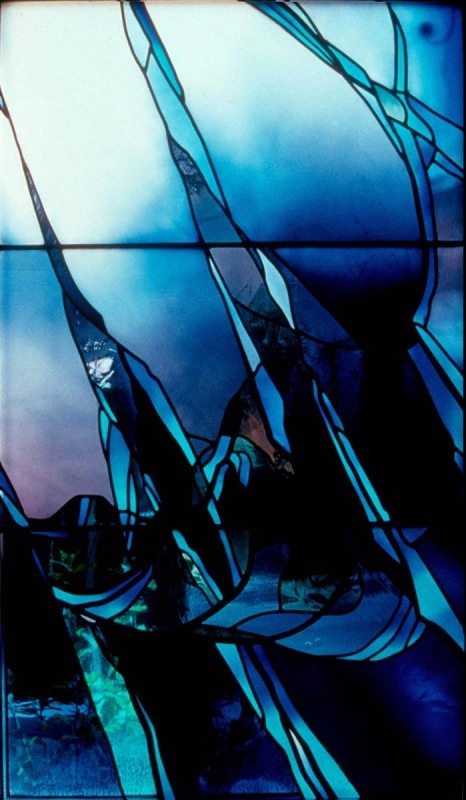 The art glass was designed to be seen both on the east and the north sides, and were phased so the Phase 1 east side could stand alone before the north side would be built. This required a very dynamic diagonal to pull the attention from east around the corner to north. 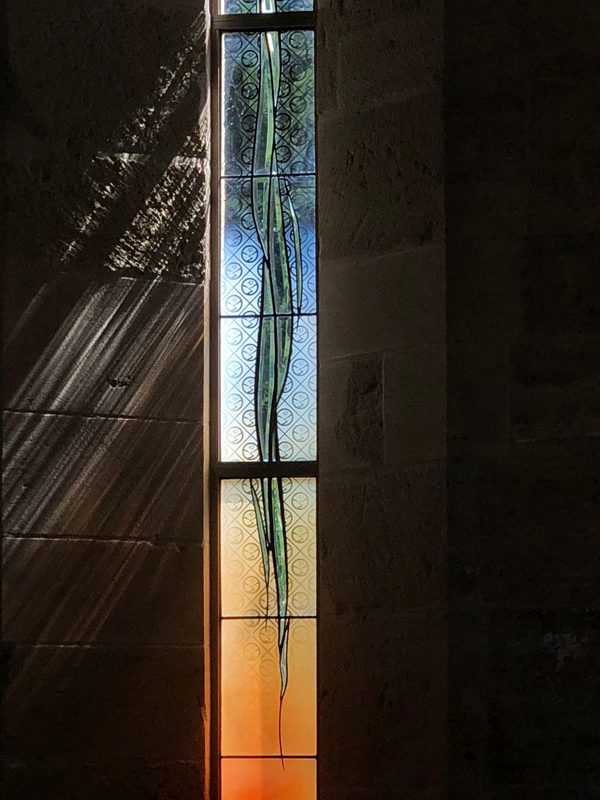 Since the east faces the morning sun the colors and coolness of morning and beginnings were depicted in the east window. The bright morning light was diffused with a triple-layered mouthblown glass. The abstract form resembles the wind lifting the sails of a ship. This can be interpreted as a connection to "Columbus" or the "wind of the Spirit"
mmoving us on our life's journey. 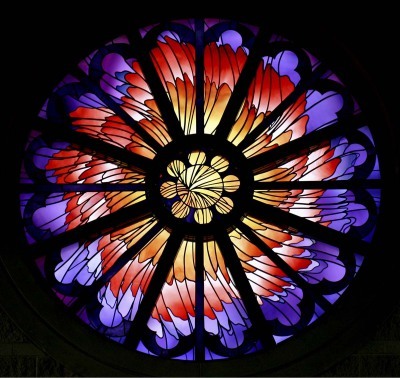 The north window depicts the rose and endings of evening. 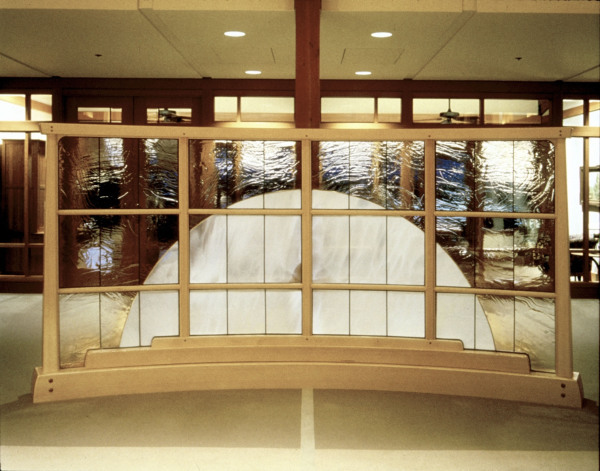 The lower sliding door leads to the Eucharistic Reservation Chapel, and inside is a clear textured "variation on a theme" of the sliding door. 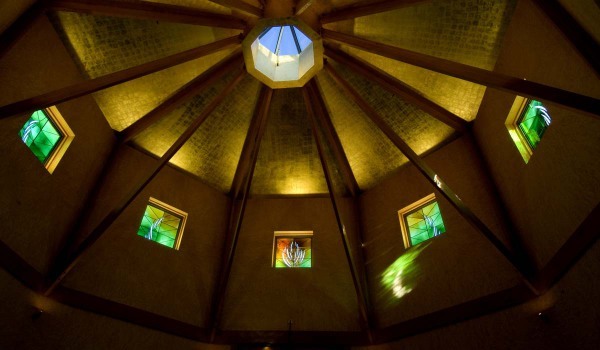 It opens visually to the outside, lighting the room and bringing in the healing elements of nature. 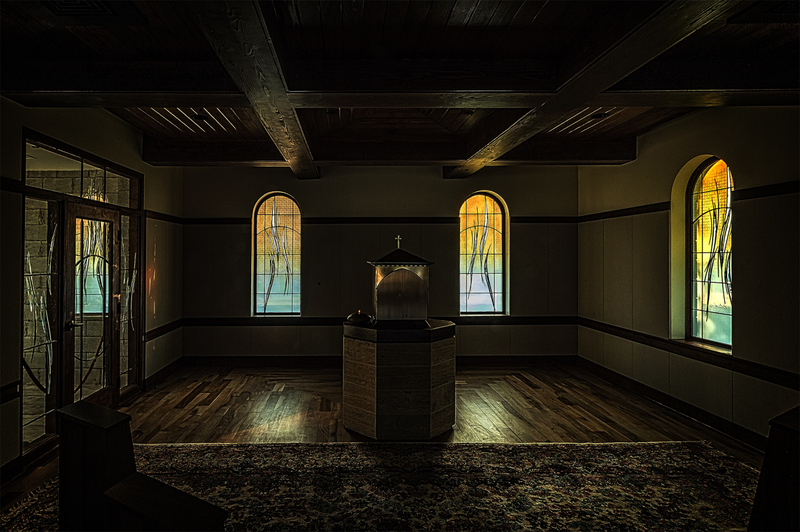 The glass panels for the Cottage Meditation Room are not stained glass, but triple-layer laminated glass. 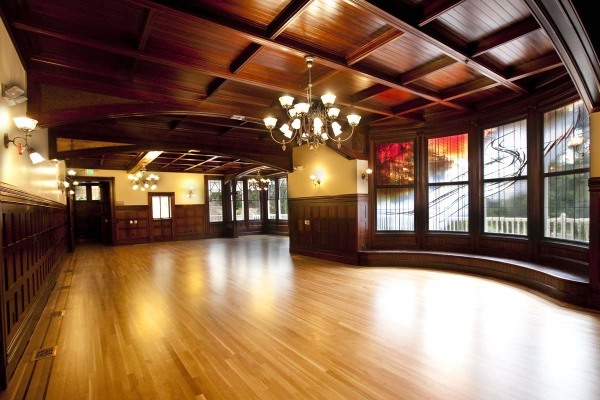 This elliptical room is a non-denominational Sacred Space and a place for meditation, reflection, and prayer. 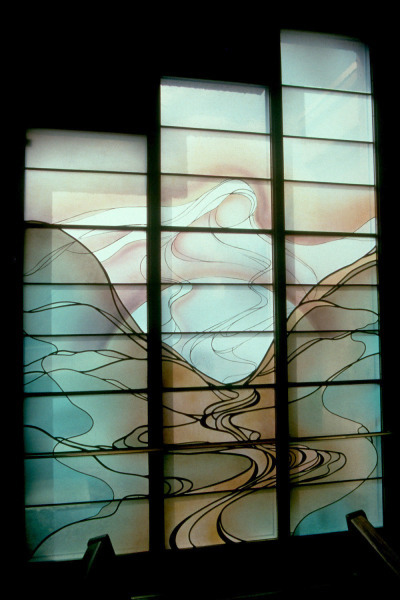 Working with hospital administrators, an architect, and an art consultant, the design is site-specific, and uses a soft watercolor technique to create a calming effect. EARTH: - Feminine, passive, symbolizes the physical body, the planet earth, mother, nourishment, stability, security, solidness, and the emotional. AIR: represents the Masculine, the intellect, breath of all life forms, invisible force, and the direction of east. WATER: becomes a metaphor for eternity, and our connection to the spiritual, and is a symbol too of the emotional . FIRE: represents the Masculine, direction of south, recognition and fame, season of summer and the passion or will. Custom mouth blown Fremont Antique Glass,was “flashed” to achieve varied shading and the perception of depth. 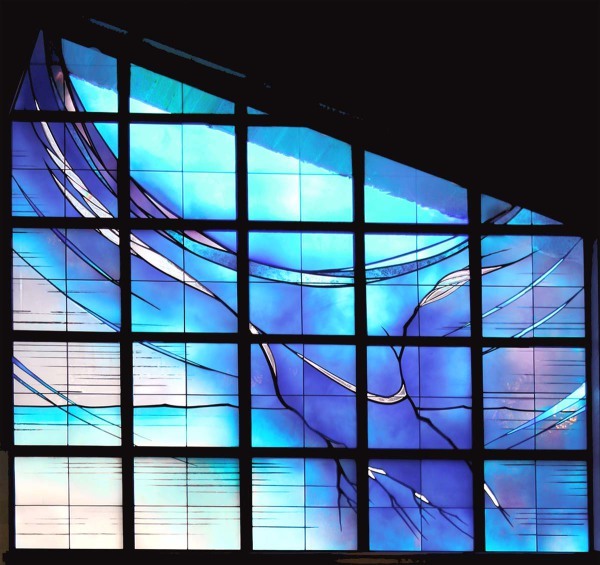 To diffuse the light, the translucent glass was also painted and kiln-fired, creating a delicate watercolor effect. The careful selection of color suggests the numinous, as the design depicts roots deep within the earth and the light of the Spirit. 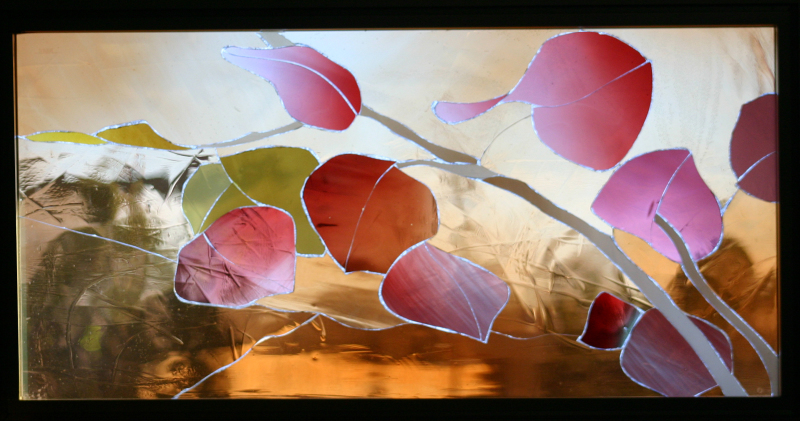 By night the lines and leaf patterns painted and kiln-fired with platinum luster become reflective. 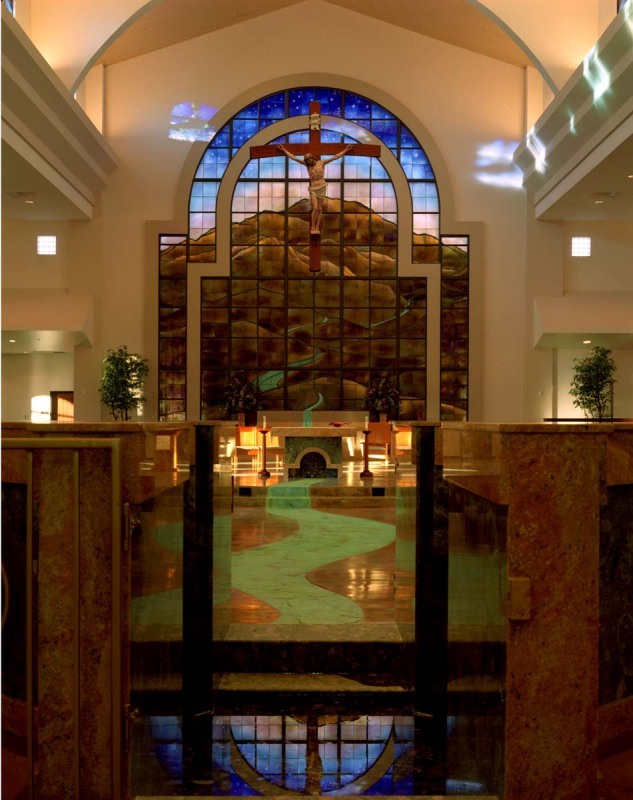 In a state dominated by the presence of the majestic Colorado Rockies, a mountain landscape was the chosen design for this hospital chapel. 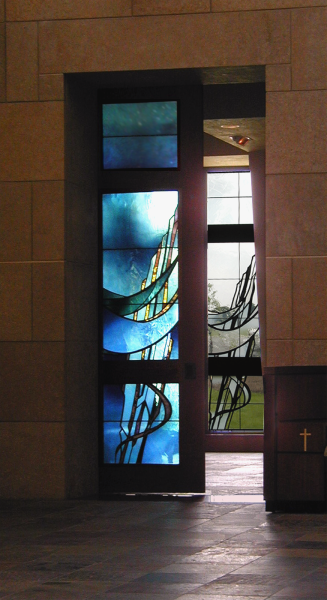 An exterior hallway view of the art glass draws the viewer within the chapel space. 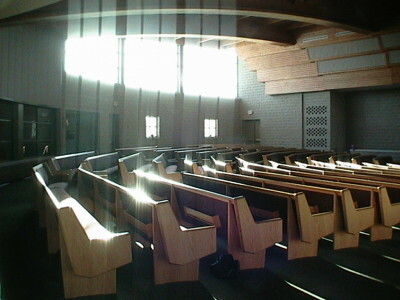 Inside the chapel, the delicate columbine pattern is visible. (bottom photo). The Columbine is the state flower. Creating a circle around the mountain landscape, the 24 karat painted and kiln-fired gold luster softly outlines and illuminates the landscape, a reminder of the presence of light in times of darkness. 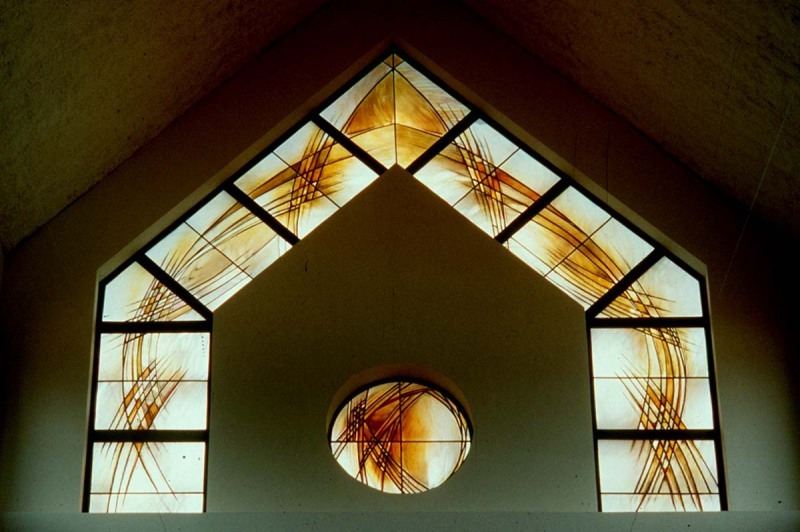 Reflecting both the spiritual values of this Japanese American community, as well as their cultural history, this east-facing window depicts an abstract landscape. It is symbolic of their ties to the land as farmers and landscapers, as it represents the present and past. The center circle flooded in light is symbolic of the community, drawn into the Light of Christ. 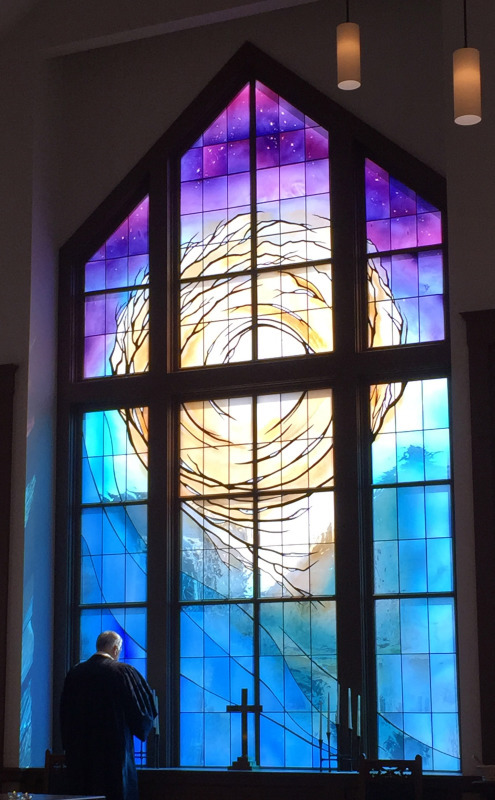 Using the congregation’s logo, a pattern was made and sprayed with 24 karat gold to create a reflective halo around the circle. This serves as a metaphor for the holiness of Christ and His place at the Center of the community. Devereaux was the art consultant with a team of architect, David Rogers of NMR, and landscape architect, Greg Melton of Lands Image for the City Plaza. In the overall scheme she designed the fountain hardscape and walkways. 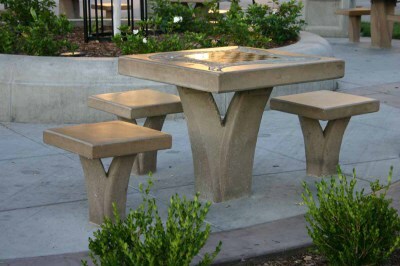 She also designed the concrete chess tables, chairs and copper light sconces in a separate public art award. Theme: Four spirals of colored concrete originate at the four street corners of the plaza and “flow” towards the central "globe" and fountain. Lithocrete (recycled glass) was applied by Hill & Co. to define both water and land mass on the 52’ diameter globe. As the spirals converge into a point on the globe they locate Chico, and its place in the global community. 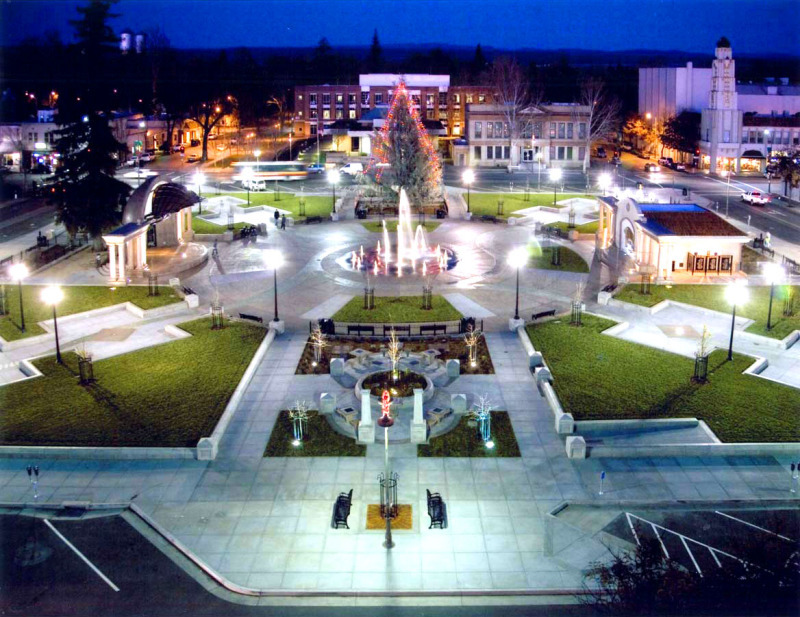 At the four street corners, the spirals represent the “headwaters” of Chico’s four creeks flowing towards the center, being the source of the water for the fountain. Commissioning Body: Chico City Council and Chico Arts Commission. 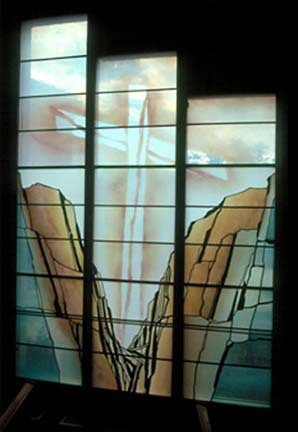 The altar window makes reference to Mt. Rose, dominating this high desert community, as well as their patron saint. 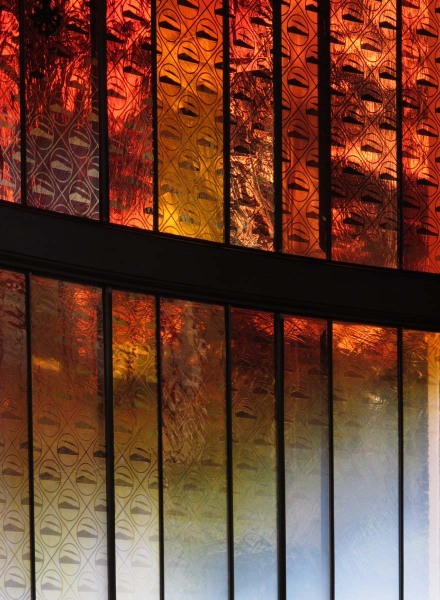 The mountain of gold iridescent glass is opaque, and behind it is the wall of the Day Chapel. 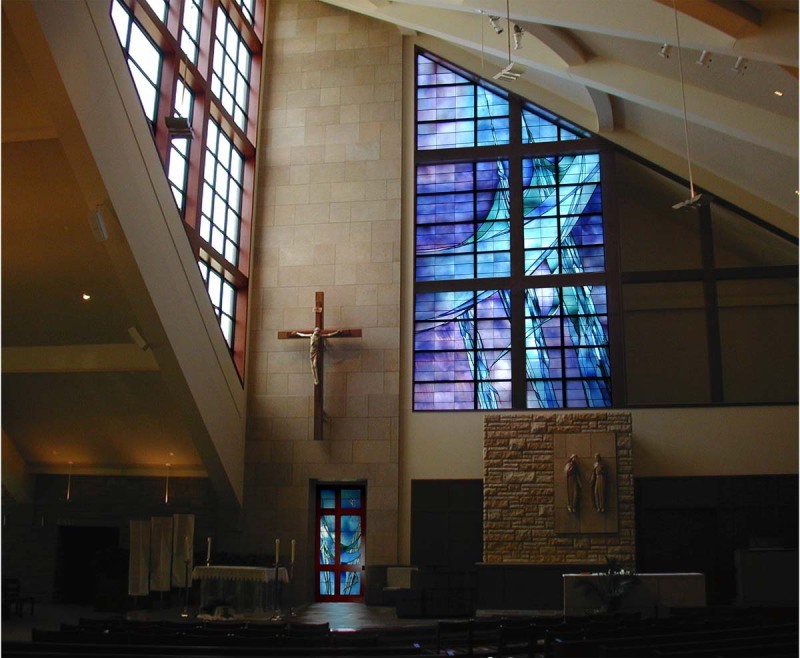 Above the "mountain" (and the Chapel roofline) the glass becomes translucent to allow in the light, but diffuse the glare of the western sun. Subtly painted and kiln-fired glass enamels and silver stain depict the dusk colors, shifting from rose to deep blue, highlighted by the scattering of sandblasted and painted 24-karat gold stars. Patinaed 1/8” copper inset in the window represents a stream, whose mountain origins flow down the window and over a bronze "rock" tabernacle at the base of the window. The water continues its journey down the worship space floor (teal stained cement) to the Baptismal Font. 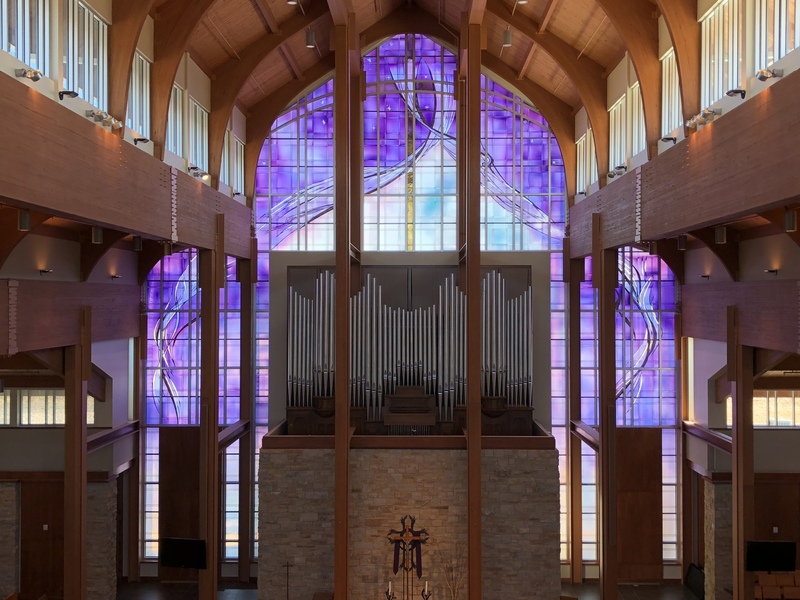 24 Clerestory windows create a "color bridge" from the back to the front of the church. 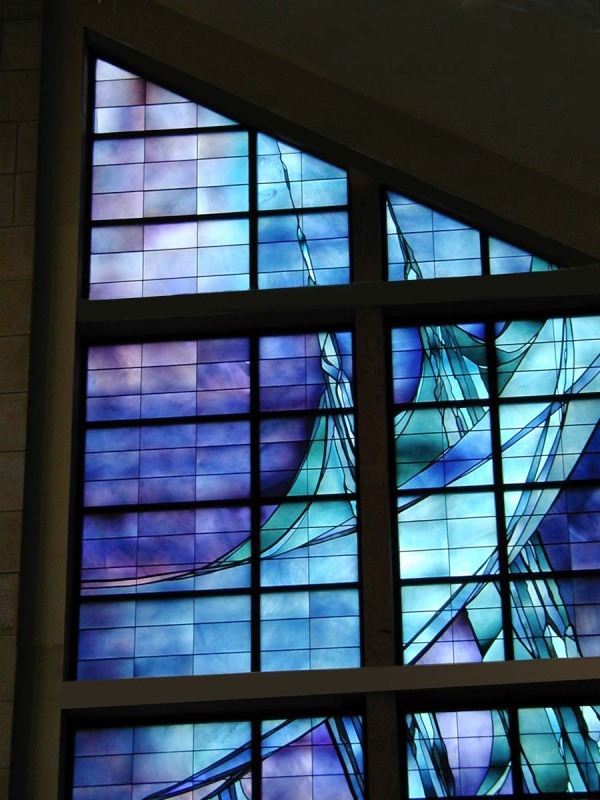 of teals to deep blue, create a “color bridge” between the sky of the Altar Window and side windows. 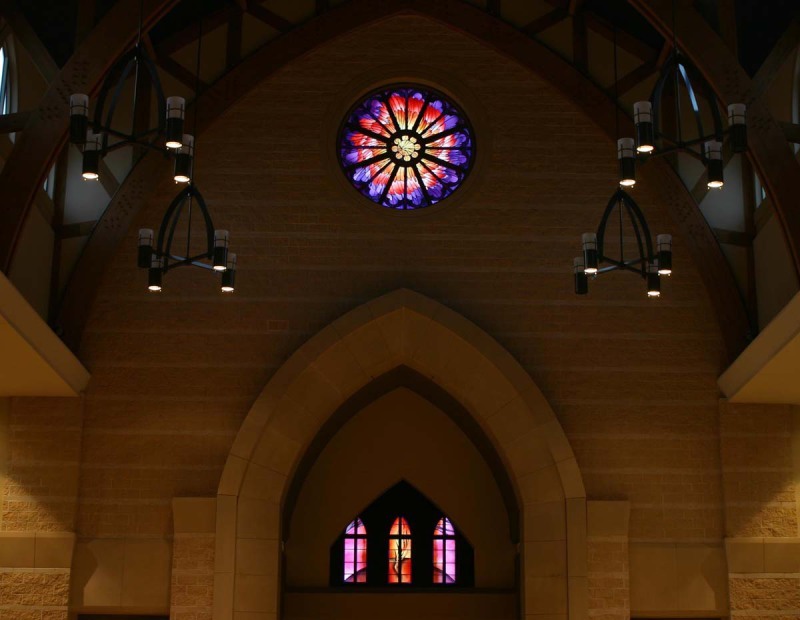 The St. Francis "Canticle of the Sun" was the inspiration for both the Rose and Chapel windows. 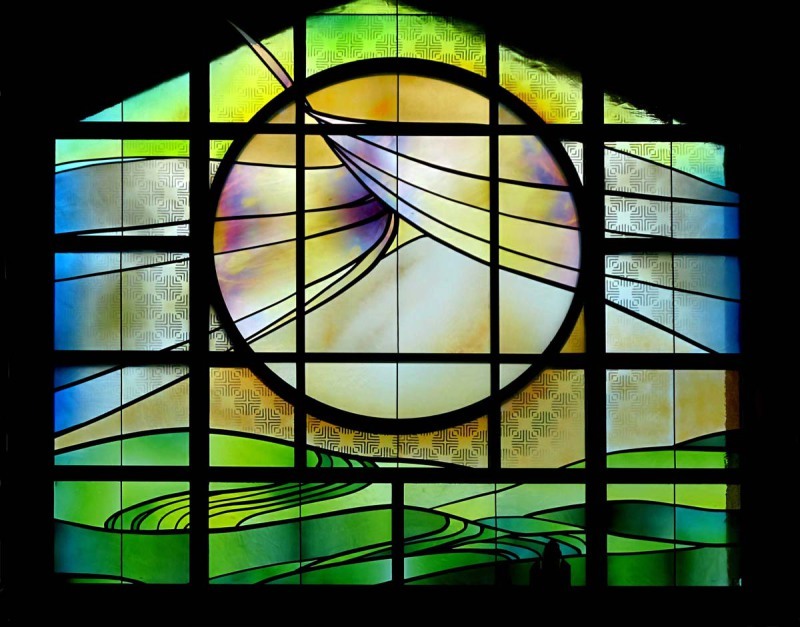 The "Brother Sun" window was designed to represent the microcosm of nature. 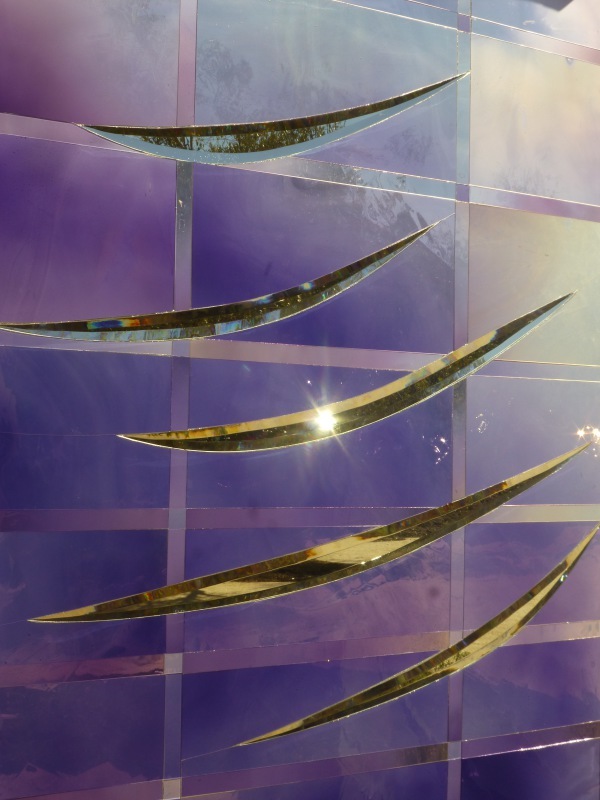 Hand blown glass in shades of purple, red to gold radiate warmth and energy, metaphors of both the sun and the Spirit. 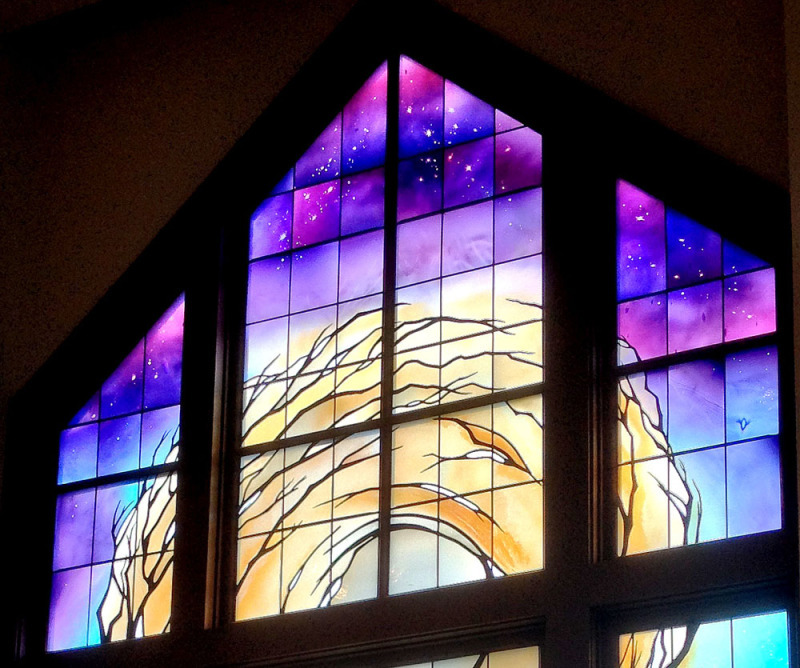 The "Sister Moon" window in the back of the church depicts the macrocosm of nature, alluding to that which is universal. The watercolor movement of hand blown glass of shaded teal, purple and blue support the message of a vast and expansive universe. CThis free-standing leaded glass room divider was installed in one of three "living room pods". A very detailed antique Chinese tapestry, depicting feathered fowl and executed in gold thread, occupied one wall in the room. 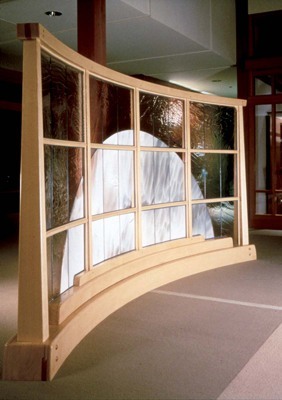 Continuing the Asian theme, but in contrast, making a very simple zen statement, the curved glass divider depicts a half sphere, or moon, set in a straight-grain pine frame reminiscent of a shoji screen. Again taking its cue from the Chinese tapestry, the feathery mouth blown white glass is haloed with 24-karat painted and kiln-fired gold luster on clear textured (reamy) glass. The choice of design simplicity sensitively mirrored the restrained and refined architectural design surrounding the divider. Architect: Armando Ruiz & Assoc. 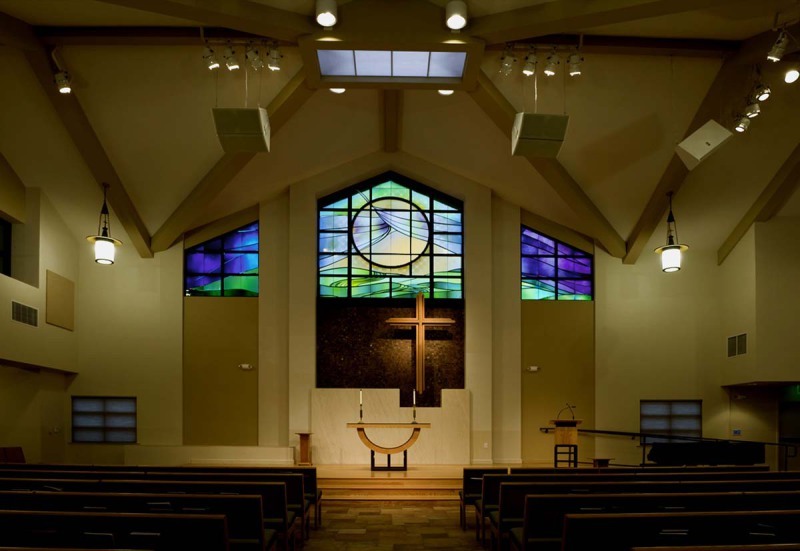 The "Hosannah" window (left) is near the Altar, and refers to the great love St. Elizabeth Ann Seton had for communion. Without imagery, the sense of the numinous presence of God is depicted. 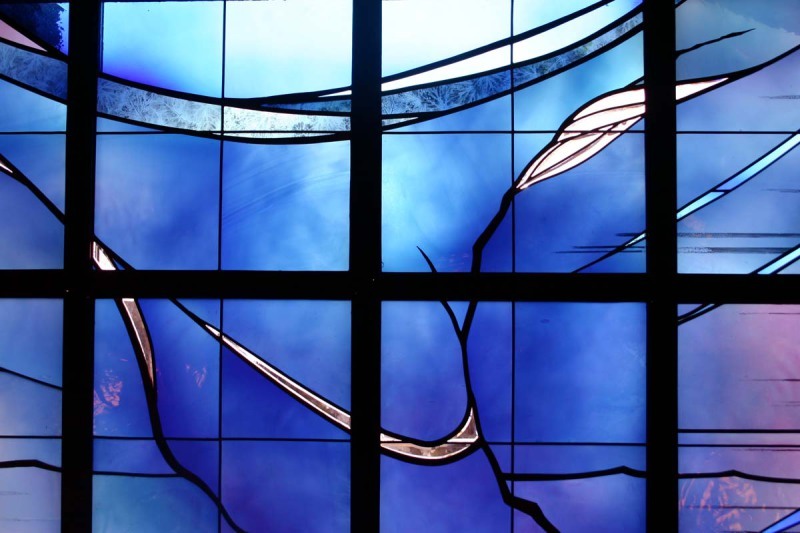 Double-flashed mouthblown glass was etched through both cobalt blue and lavendar layers to the clear (white) base layer. --(left) Mary, the Mother of God, gathering her many children of the world. -- (right), from Scripture, "I will break down the walls of enmity between you by means of the Cross."